The Eighty-third United States Congress was a meeting of the legislative branch of the federal government of the United States in Washington, D.C. from January 3, 1953, until January 3, 1955, during the last two weeks of the Truman administration, with the remainder spanning the first two years of Dwight Eisenhower's presidency. It was composed of the Senate and the House of Representatives. 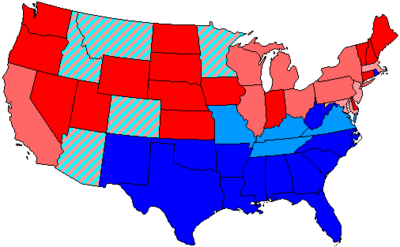 The apportionment of seats in the House was based on the 1950 U.S. Census. Both chambers had a Republican majority. 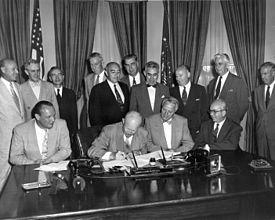 President Eisenhower signs the Atomic Energy Act of 1954. Senators are popularly elected statewide every two years, with one-third beginning new six-year terms with each Congress. Within each state, senators are listed in order of seniority. Preceding the names in the list below are Senate class numbers, which indicate the cycle of their election, In this Congress, Class 2 meant their term ended with this Congress, facing re-election in 1954; Class 3 meant their term began in the last Congress, facing re-election in 1956; and Class 1 meant their term began in this Congress, facing re-election in 1958. (2) Willis Smith (D) Died June 26, 1953. (3) Charles W. Tobey (R) Died July 24, 1953. (3) Robert A. Taft (R) Died July 31, 1953. (2) Dwight Griswold (R) Died April 12, 1954. (3) Clyde R. Hoey (D) Died May 12, 1954. (2) Lester C. Hunt (D) Died June 19, 1954. (1) Hugh A. Butler (R) Died July 1, 1954. (2) Burnet R. Maybank (D) Died September 1, 1954. (3) Pat McCarran (D) Died September 28, 1954. (1) Samuel W. Reynolds (R) Did not run in the special election to fill seat. (2) Eva Bowring (R) Did not run in the special election to fill seat. (3) Robert W. Upton (R) Lost special election to fill seat. (2) Alton Lennon (D) Lost special election to fill seat. (2) Edward D. Crippa (R) Did not run in the special election to fill seat. (3) Ernest S. Brown (R) Lost special election to fill seat. (3) Thomas A. Burke (D) Lost special election to fill seat. (2) Charles E. Daniel (D) Resigned December 23, 1954. (2) Hazel Abel (R) Resigned December 31, 1954. ^ "Eisenhower Presidential Library". www.eisenhower.archives.gov. Retrieved December 10, 2017. ^ "1954 Shooting | US House of Representatives: History, Art & Archives". history.house.gov. Retrieved December 10, 2017. ^ Network, The Learning. "March 1, 1954 | Puerto Rican Nationalists Open Fire on House of Representatives". The Learning Network. Retrieved December 10, 2017. ^ "U.S. Senate: The Censure Case of Joseph McCarthy of Wisconsin (1954)". www.senate.gov. Retrieved December 10, 2017. House of Representatives Session Calendar for the 83rd Congress (PDF). Official Congressional Directory for the 83rd Congress, 1st Session. Official Congressional Directory for the 83rd Congress, 2nd Session. Pocket Congressional Directory for the 83rd Congress.